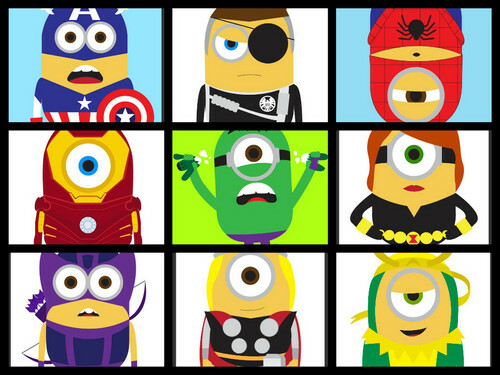 Marvel Minions. Captain America, Nick Minion Fury, Spiderminion, Hulk, Ironminion, Black Widow, Hawkeye, Thor and Loki. HD Wallpaper and background images in the minions de mi villano favorito club. This minions de mi villano favorito fan art contains tragaperras, un bandido armado, ranura, máquina tragaperras, máquina de monedas, máquina de ranura de moneda, and vitral.